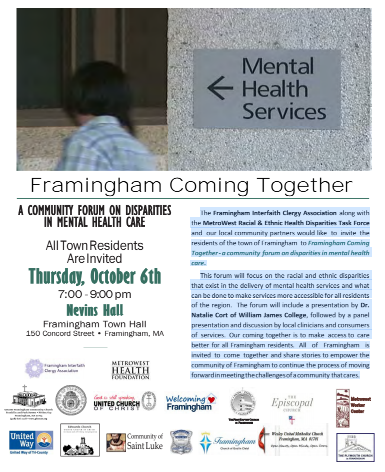 The Framingham Interfaith Clergy Association, along with the MetroWest Racial & Ethnic Health Disparities Task Force and local community partners, is hosting a Framingham Coming Together forum on disparities in mental health care next month. The free event is scheduled for Thursday, Oct. 6 at 7 p.m. in Nevins Hall in the Memorial Building. 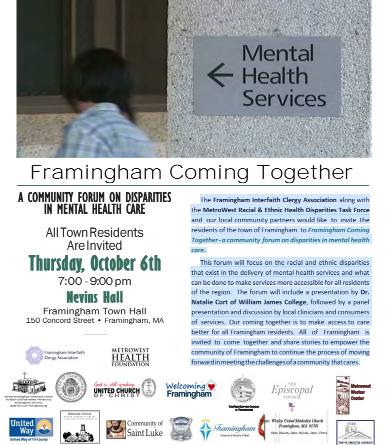 This forum will focus on the racial and ethnic disparities that exist in the delivery of mental health service, and what can be done to make services more accessible for all residents of the MetroWest region. The forum will include a presentation by Dr. Natalie Cort of William James College, followed by a panel presentation and discussion by local clinicians and consumers of services. The free event is open to the public. Residents are encouraged to attend and participate.